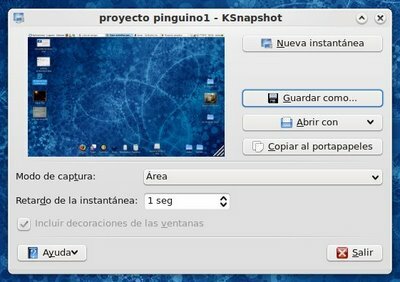 A good screen capture Download It is called Ksnapshot and is a very simple tool to use to capture shots from the PC screen.It's available for free and you can now download it to start enjoying your benefits. Compatible with Linux. Although it is a very simple utility that only allows us to capture a window or an image that we see on the internet and save it to our PC, many people use it to, for example, send the photograph of an error in an access, to show steps to Follow in a tutorial, etc. With Ksnapshot you can capture the full screen , single window or also a specific area. It allows us to copy the shot to the clipboard, save it to an image file or print it. It is compatible with most popular formats such as PBM, TGA, PCX, PGM, PNG, JPG, PPM, EPS, RGB, XPM and BMP.